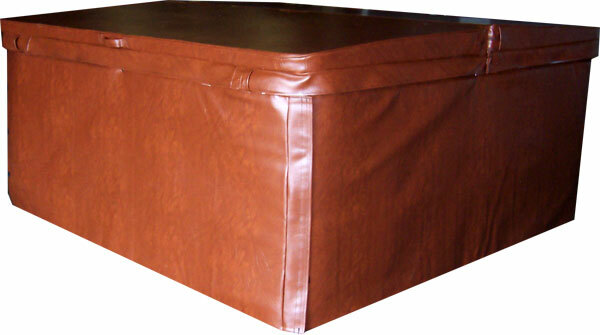 The Brand new "Eco Friendly" energy saving spa cabinet jacket is made with two layers of 28 oz marine grade Spa Hyde vinyl sandwiching one half inch of foam. The Spa Cabinet Jacket installs as 4 separate sides that snap to the spa cabinet and velcro together at the ends making it easy to install in the fall and remove in the spring. The Spa Jacket does not interfere with the spa cover use in the winter months. (Jacket stays connected to spa when the spa is in use.) This greatly reduces the spas winter operating costs as well as protecting the cabinet from the harsh winter elements. The perfect retrofit item to save money on spa operating costs. The Spa Jacket is custom built to fit your spa and available in any of our 7 attractive colors. Installation is simple only requiring a few receivers to be attached to the side of the cabinet. Once installed the Spa Jacket traps heat energy that would normally escape to the outside back into the spa. This can add up to significant savings in operating costs in the cooler weather. In order to build the spa jacket to fit your spa we need to know two measurements. We need to know the height of your spa cabinet and the perimeter of the spa cabinet at the widest point. There will be a place in the check out for you to enter this information. The spa jacket will ship to you by UPS within 3 business days of us receiving your order. Payment is due before we can start construction of the item. Since this is a custom built item returns are not available. Copyright © Spa Guy LLC. All rights reserved. *Free Shipping offer applies only to items purchased on spaguyusa.com and shipped inside the contiguous United States. Some restrictions apply.